The Bouncing Bulldogs are committed to the protection of personal information provided by all individuals who visit our website. Our policy for the gathering and use of information on the website www.bouncingbulldogs.org is outlined below. All information collected on www.bouncingbulldogs.org will be kept strictly confidential and will not be sold, reused, rented, leased, loaned, traded, or otherwise disclosed to a third party. 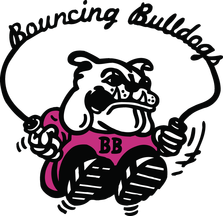 Information provided will be used to keep you informed about news concerning the Bouncing Bulldogs or to reply back concerning any questions, concerns or comments that you may have. We will automatically collect and store your computer’s IP address in order to improve our performance. IP addresses help us to analyze general visitor demographics so that our site can be maintained in such as way as to benefit our users in the most efficient way. This information will not reveal any personal information. In accordance with the Children’s Online Privacy Protection Act of 1998, we will never knowingly request personally identifiable information from anyone under the age of 13 without prior verifiable parental consent. If you are under 13 and would like to participate in certain features of our website that require your personal information, please have your parent or guardian send an email with a verifiable identity, giving us permission to allow your information to be used. If we have not received parental permission for a user who states to be or is found to be under 13, we cannot respond to that user. If you have any questions concerning the policy above please email us at webmaster@bouncingbulldogs.org. Should our policy change, we will post changes here so that you are continually aware of what information we collect and how we use it.